Surrounded by the Julian Alps, Lake Bled represents the beauty of its country. This lake, together with a little town, that shares its name, offers you a full experience of Slovenian culture, gastronomy, and nature. All you have to do is come and feel it! The city of Bled and its lake have a lot to offer to their visitors. The Bled Castle, island in the lake and Pletna boat are waiting for you! You can get to Lake Bled from Ljubljana, Zagreb, Venice, Klagenfurt, etc. Find the way that suits you best and come to see this beauty! The best hotels, hostels, and apartments in Bled are waiting to be booked. Choose the perfect accommodation and make a reservation now! If you want to make a one day trip to Lake Bled with a private transfer and a guide, let us know and we will plan your your visit! Bled is a small town located in the northwestern part of Slovenia, just 50 km from Ljubljana, the state capital, and close to the border with Austria. The town lies on Lake Bled and is surrounded by the Julian Alps. Because of its position, it has a mild climate and is one of the warmest Alpine resorts. This place offers something for everyone. It is a perfect hideout for couples in love, but it also offers a wide range of activities for those that prefer an active holiday. 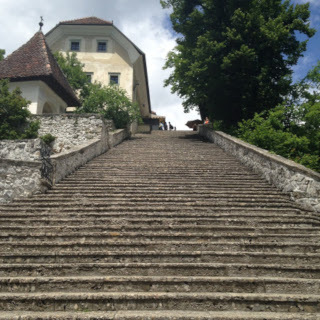 Rich in culture, with its churches and the famous Bled Castle, it is a must see for all history enthusiasts, as well. Since Slovenia is a small country, and Bled is a small town, you can easily visit several sites in just one day. 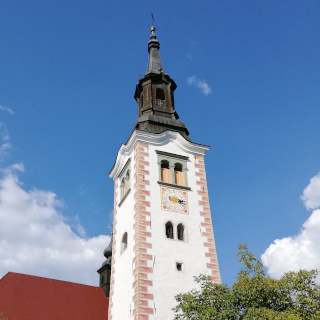 But please note that there is a lot to see and do in Bled, as well as in its surroundings, so if you want to make the most of it, take a few days off and discover all the pearls of this region. What makes Bled so unique is, without any doubt, the Lake Bled. It is the most famous one of 300 Slovenian lakes. The Lake Bled, that is nowadays surrounded by mountains and forests, is of glacial origin and is located at an altitude of 475m. Lake Bled is 2120m long and 1380m wide, and it covers the area of 1,45km2. With the maximum depth of 30m and a 6km long trail around it, the lake offers you all sorts of activities, such as swimming, fishing, rowing, hiking or cycling. The real Bled treasure lies in the middle of the lake. 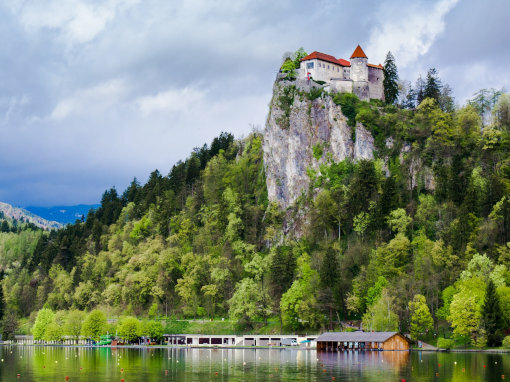 The Bled Island is the only natural island in Slovenia, as well as one of its most recognizable symbols, along with the Bled Castle and Postojna Cave. You can get to the island by Pletna, the traditional boat characteristic for this region. The Pletna boat is a flat-bottom boat made entirely of wood. It has a pointed bow and the widened stern, to enable passengers to enter. The specially trained oarsman operates the boat, using a special technique of rowing. So not only do you get a ride, but you also get a unique experience, that only Lake Bled has to offer. There are several starting points around the lake (each with different length of the ride) and for a fee of 14 euro per person, you can hop on one of the Pletna boats and enjoy a nice and peaceful ride to the island. Pletna boat leaves for the island every 45 minutes, and the most common ride takes 20 minutes. The Lake Bled is home to The Church of the Mother of God on the Lake. To get to the church you will need to climb 100 steps. Legend says that in the old days, on a day of his wedding, the groom had to climb the stairs with a bride in his arms. Only when he successfully got to the top, he was able to marry his loved one. This tradition still continues, so couples that decide to marry on the island (should!) do it. The church that stands today is a Baroque church that dates back to the 17th century. It was constructed on a place where an older Gothic church stood. The church still has fragments of frescoes with scenes from the life of the Virgin Mary, but what makes it interesting to the tourists is a wishing bell that you must ring three times in order to get your wish fulfilled. Along with the church stands a Gothic bell-tower with pendulum clock, which gives you an amazing view of the surrounding area. If you are interested in ringing the wishing bell and climbing the bell-tower, you will have to buy a 6 euro ticket. The church and the tower are open for public every day from 9 am to 7 pm (9 am – 4 pm during the winter months). You can find out more here. If you do not intend to enter the church, you can spend your time in a restaurant or gift shop. Since you usually have 45 minutes on the island (if you are taking the Pletna boat) we recommend that you try a traditional Potičnica cake. The Bled Castle is located on a cliff, 130m above the lake. 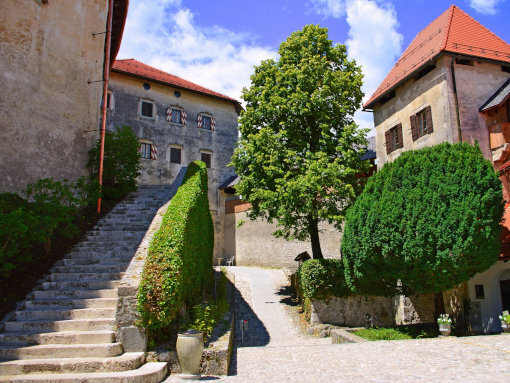 This medieval castle is the oldest one in Slovenia – it was first mentioned in a written document in the 11th century. As it rises above the lake, the castle offers a breathtaking view on the Bled Island and the mountains around the lake. Because of its position, it is usually the first stop for those visiting the city of Bled. More than thousand years ago the Bled Castle, formerly known as Castellum Veldes, has been the residence of the Bishop of Brixton. Since the bishop never actually lived in Bled, he decided to lease the property to the local noble families. This continued for the next few hundreds of years, until the 19th century, when the government decided to nationalize the property. In the 19th and 20th century Bled Castle has changed many owners, none of whom was able to manage the estate. It was only in the 1950s, after a number of owners, an earthquake and a fire, that the castle got the much-needed attention and care. 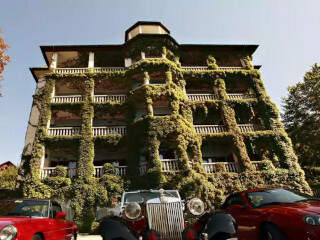 The complete renovation of the estate began in 1952 and it went on for 10 years. The museum part of the castle, however, was renovated just 10 years ago, in 2008. The castle consists of several buildings, which are arranged around two courtyards. The courtyards lie each on a different level and are connected with a staircase. The lower level houses the print shop, gallery, “Beehive” (shop with honey products), café and wine cellar. A chapel dating from the 16th century, museum, gift shop, restaurant, and forge are arranged on the upper level. Besides the above-mentioned buildings, there is also a Roman defense wall that used to protect the castle from the invaders. The Bled Castle is open for public every day from 8 am to 8 pm (8 am – 6 pm in winter). The usual entrance fee is 11 euro, but there are discounts for students, children, and groups. For more info about the castle’s working hours and ticket price, please check the following link. Because of its great infrastructure, there is a wide range of activities and demonstrations you can participate for the additional fee. For example, you can bottle your own wine in the wine cellar, make your own golden coin in the forge or print something on a replica of Gutenberg’s printing machine. You can also sit and relax in the castle’s café and try the famous Kremšnita (vanilla cream cake). If you are dreaming of a fairytale wedding, Bled Castle might be just the right choice for you. The wedding ceremony takes place in the castle courtyard, while the reception follows in the restaurant. Not only weddings, but many other kinds of events are held here, from political meetings and business conferences to the Medieval festival and plays. 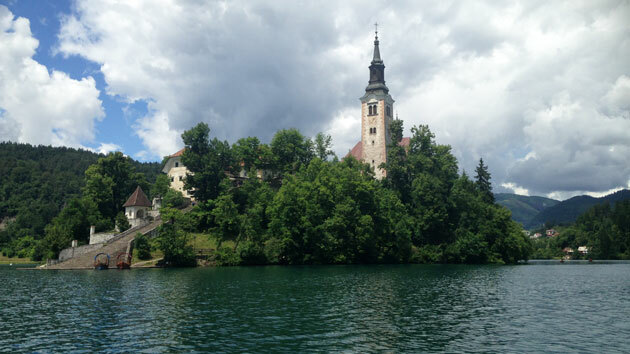 You can get to Lake Bled by car, plane, train, public bus or organized transfer. As Slovenia is moderately small country, you can easily get from one place to another in just an hour or two. 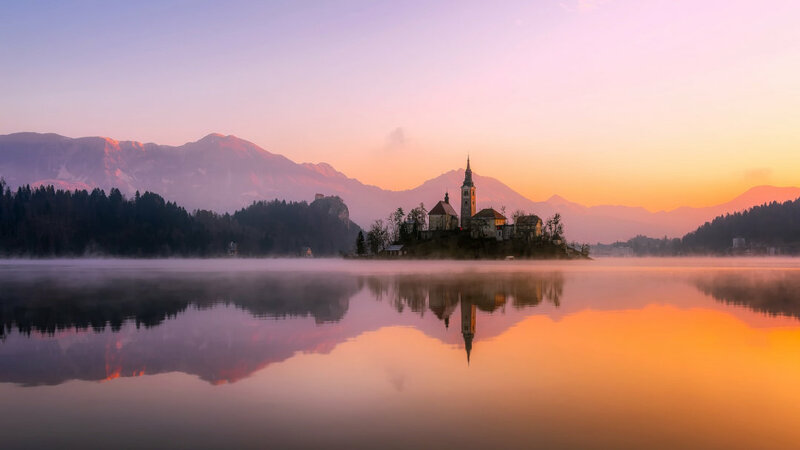 If, however, you don’t plan to stay in Slovenia, you will be happy to know that Bled is located only 20 minutes drive from the Austrian border and 1h20 from the Italian border. If you are driving from Ljubljana, get on the motorway A2/E61. Take the Exit 3 (direction Bohinj/Pokljuka/Bled), continue to the roundabout and then take Exit 2 to Bled/Lesce. It will take you about 45 minutes to get from Ljubljana to Bled. If you are heading to Bled from Zagreb, take the motorway A2/E70 to Lesce. Then take Exit 3 (direction Bohinj/Pokljuka/Bled) and continue to the roundabout where you will take Exit 2 (direction Bled/Lesce). Altogether it will take you about 2h15 to get there (if there is no traffic at the border). If you are planning your visit from far away, then you are probably taking the plane to get to the Bled area. The closest airport is the one in Ljubljana (Jože Pučnik Airport) and it is only 20 minutes drive away from the city of Bled. Your other options are airports in Portorož (170km from Bled), Maribor (175km from Bled), Zagreb (200 km from Bled), Trieste in Italy (170km from Bled) or Klagenfurt in Austria (65km from Bled). If you’re arriving by public bus, check out the links below for the detailed bus schedules and plan your trip! Please note that you will most likely have to take the bus to Ljubljana and then take another one to Bled. The central Bled bus station is only 5 minutes walking distance from the lake, but there are more stations on your way, depending on what you are planning to see. If you are taking a train to get to Bled, you should get off on the Bled Jezero station. 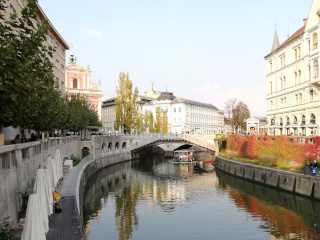 This is an easy and comfortable way to access the area from Ljubljana, Zagreb, Klagenfurt, Villach, Trieste or Venice, but you must note that train takes more time to get there then bus or car. If you get tired of walking around the lake, you can always hop on the bus. However, if you prefer something more authentic, there is a tourist train that operates every day from June to September (9 am – 9 pm) every 45 minutes. You can also choose to drive in Coachmen Fijaker and discover Bled with the traditional open carriage. That way you can learn more about traditional Slovenian clothing since the coachmen are always wearing their uniform – embroidered vest, white shirt, black trousers, a black sweater, and black hat. 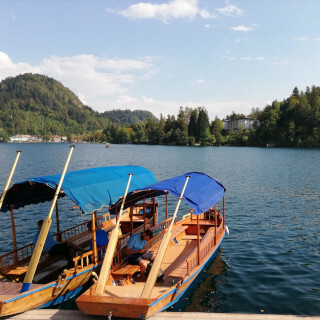 If you decide to get on the water, besides from the traditional Pletna boat, there is also a wooden electric boat, that operates daily according to the Bled Island working hours. And, finally, if you are a sports enthusiast, it is possible for you to rent your own boat and row your way to the island. Whether you are coming in summer or in winter, the city of Bled will welcome you with arms wide open. This place will always find a new way to steal your breath away. 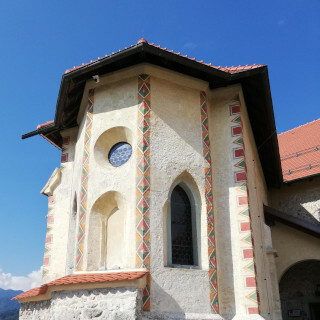 In the summertime, you can enjoy a swim in the lake, a ride on the boat, a wind in your hair while cycling around the area, a taste of traditional Slovenian specialties or a peaceful visit to one of the local churches. In winter, however, you can try skiing in the mountains, crossing the frozen lake (only for the brave!) or just wake up the child inside of you and go sledding instead. The average air temperature in the summer months (June-August) is around 22°C – it goes from 20°C to 25°C. During the winter the temperature usually goes below zero, from -1°C to -10°C. The average water temperature of the Lake Bled is 23°C in summer and 10-15°C in spring and autumn. The lake freezes during the winter, which means that the temperature of the water is around 0°C. If you are interested in staying in Bled, there is a great number of hotels and private accommodation available both at Lake Bled and in the town. Here is a list of our favorites! 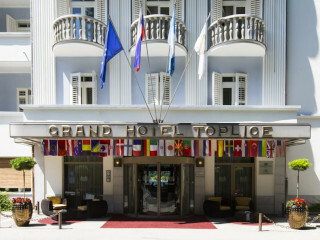 If you are looking for a luxurious stay in Bled, try Grand Hotel Toplice. It has a great view of the lake and the castle. Among the various facilities that this hotel has to offer, there is a restaurant, thermal pool, wellness, sauna, and private beach. The hotel offers you a full service – from room service to laundry and ironing. For more information follow the link. If you are looking for a low key place to stay, Hotel Jadran might be just the right place for you. Located on a small hill above the lake, this old villa offers you a great view and a romantic vibe. For an affordable price, you can get a room with a bathroom (breakfast included), free parking and free Wi-Fi. Book a room here. For those that prefer private accommodation over a hotel, Vila Ajda is the right place to stay at. This old villa offers you bed and breakfast in one of their three suites. Each suite has a bedroom, living room, bathroom, and balcony. 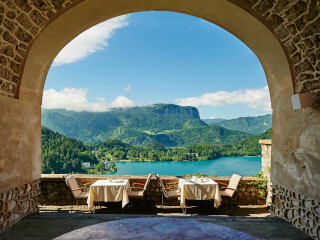 Just down the stairs, you will find one of the most charming restaurants in Bled, with the best view of the lake. Follow the link for more detail. After spending your day at Lake Bled, a good meal is just what you need to conclude your visit. 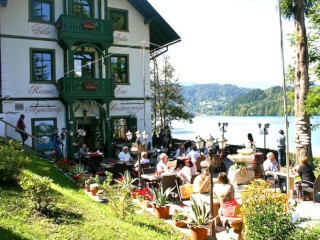 There is a great number of restaurants near the lake, mainly located within the hotels, such as Hotel Park or Hotel Bled. But if you prefer something more traditional, check out the list of our suggestions! If you wanna feel like royalty, even if it’s just for a few moments, consider making a reservation in Bled Castle restaurant. Not only are you served tasty food, but you are also served a magnificent view here. The restaurant offers traditional local food with a dash of modernity. That means you can try everything from lamb and sausages to crayfish and mushrooms, but always with the twist. The restaurant is opened daily from 11 am to 10 pm, but please note that prior reservation is required. You can book your table here. The Vila Ajda restaurant is specialized in traditional Slovenian food, which means they offer plenty of meat. 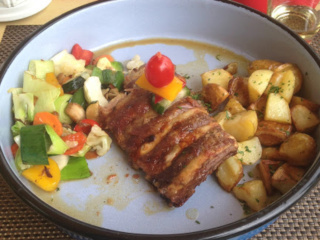 Roasted ribs are the house specialty and a must-try. But the restaurant also offers meat-free dishes, as well as dishes for diabetics and people with food allergies. 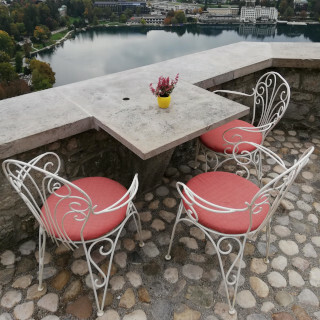 Besides that, you will have a great view of the Bled Castle and the lake from the restaurant’s terrace. The restaurant is open every day, except Tuesday, from 12 pm to 10 pm. Check it out following the link. The Park Café is known as a home to the original Bled cream cake. 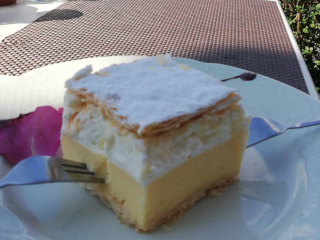 The famous Kremšnita is a must on every visit to Bled. Here you can try not just the original cream cake, but also by many the best one! All this goes with a nice view of the lake, of course. Follow the link for more detail. The Bled region has a lot to offer to its visitors. It is an ideal destination for those who enjoy an active holiday, but also for those who like to spend their time outdoors, in contact with nature. 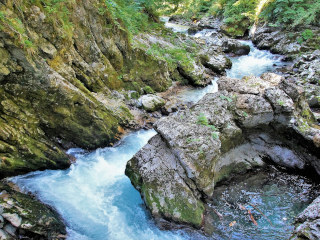 Only 4 km from Bled you can encounter the Vintgar gorge. This 1.6km long gorge found its place in the Radovna Valley. You will walk through the hills, cross the wooden bridges, see the stone bridge of the Bohinj railway and the stunning Šum waterfall. The cave under Babji zob is located only a few minutes drive from the Lake Bled. It is a 300m long cave rich in stalactite formations. 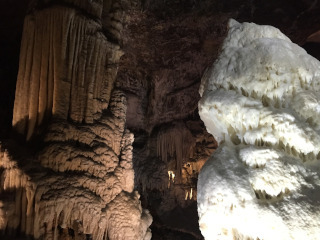 The cave owes its unique value to the so-called helectites – spiral stalactites. Just a few kilometers from Bled you can visit the Iglica waterfall which hides in the caves of a mountain. There you can climb to the top of the cliff by using a wooden stairway or try one of the climbing routes. For all the adrenaline junkies out there, we recommend The Zipline Dolinka, that offers a 2 and a half hour outdoor experience on 5 zipline cables in a total length of 2,4 km. If you are up for a milder version of this sport, there is an Adventure Park near Bled that might be fun for the whole family. 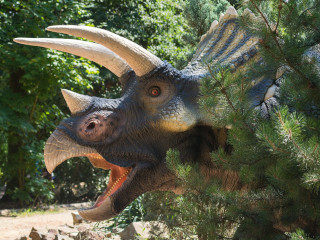 Another activity that is suitable for families with kids is a visit to Dinopark Bled. This theme and amusement park will take you back thousands of years, and not only will you have fun there, but you will learn a thing or two. You might not know that, but the Bled area is famous for its honey products. 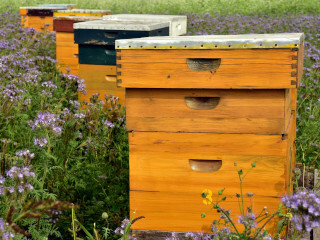 Slovenia has a long tradition of beekeeping and an important role in apiculture development. In fact, the World Bee Day is actually the birth date of Slovenian beekeeper, Anton Jansa! 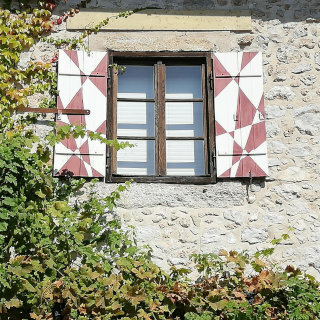 If you want to know more on this matter, you should think about visiting The Museum of Apiculture near Bled. 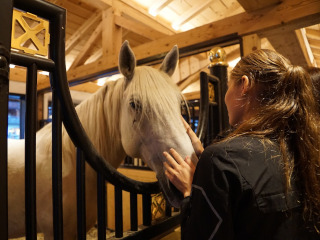 If you are a horse lover, you should pay a visit to Lipica stud farm. This farm is the oldest stud farm in Europe. For centuries the graceful Lipizzaner stallions take their first steps here. The farm is located 1h30 drive from Bled, but it sure pays off to drive there since it offers a unique experience. One of the most visited sites in Slovenia, along with Ljubljana and Lake Bled, is Postojna. The Postojna Cave Park is the largest show cave in Europe, famous for its captivating cave formations and diverse fauna. We would definitely recommend it! If you are a nature lover don’t miss visiting the Triglav National Park. The Park is part of the Julian Alps area and it is the only national park in Slovenia. 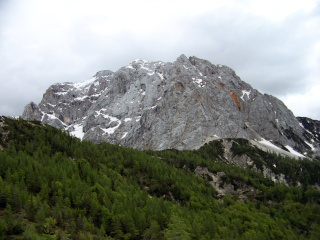 It was named after Triglav – Slovenia’s highest peak. You can climb to the top or hike across the mountains. People still live in the park’s protected area, so you have an opportunity to visit one of the local farms, as well, and even try their products. 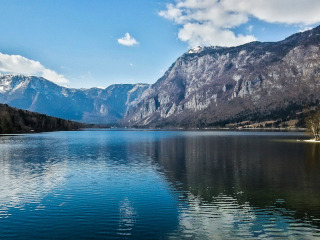 Not far from the Lake Bled, the second most famous Slovenian lake is located – Lake Bohinj. The Lake Bohinj is the largest lake in Slovenia and it is a paradise for adventurers and nature lovers. 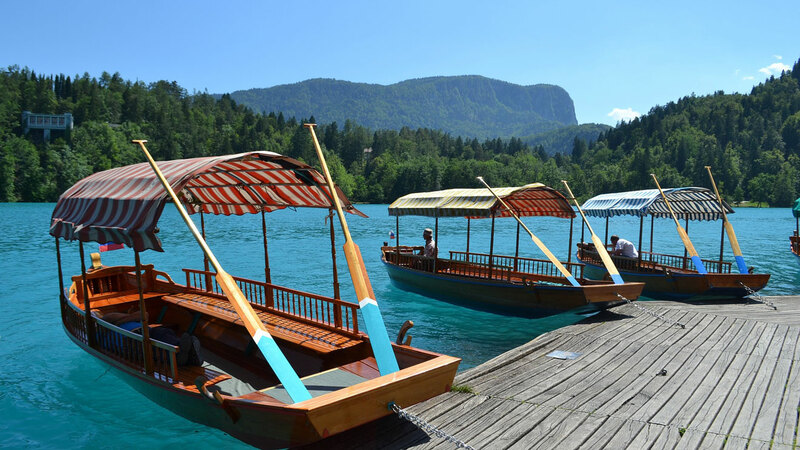 Although it doesn’t offer as many cultural sights as Lake Bled, it is a great place to visit if you enjoy peace and quiet, and just looking to spend your time in nature. The mountains that surround the Lake Bohinj are a popular ski destination. One of the places you can visit, if you enjoy skiing, is the Vogel Ski Center. It might be a good place to visit during the summer, too, since there is a cable car, which gives you the opportunity to see the area from above. When staying in Bled, don’t miss a chance to visit Ljubljana, country’s capital. It’s a 50 minutes drive, but it sure pays off. Ljubljana is one of the smallest European capitals and is famous for its bridges over the Ljubljanica River. 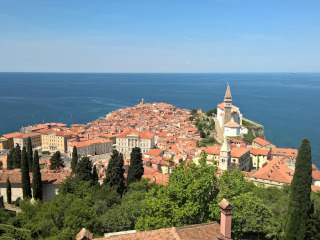 If you are planning on spending your summer holiday in Slovenia, check out the summer destinations such as Portorož or Piran. Both towns lie near the Adriatic coast and have everything you need for a perfect holiday-by-the-sea. Marzito organizes day-trips or transfers to Slovenia from Croatia or vice versa. Explore our other offers here. For more information and offers, feel free to contact us! First of all, we would definitely recommend a visit to Bled Castle. It is one of the best-kept castles in Europe and a must-see when visiting Slovenia. Second of all, if you are planning on hiking, cycling or doing any other sports activity, wear some comfortable shoes and clothes. And finally, try to get to the lake as soon as possible to enjoy the most of it, because there is plenty to do here.